Golf is one of America’s favorite pastimes and you’ll find plenty of places indulge across the state of Maine. From world-class courses in the mountains perfect for those colorful autumn days or a coastal green with sea views, you have plenty of courses to play your 18 holes. Here are the best! The Samoset Resort Golf Course is an award-winning historic golf course in coastal Rockport. Designed as a nine-hole course in 1902, the course was rebuilt in 1974 as an 18-hole course by Robert Elder. The course offers breathtaking ocean views and has one of the most difficult finishing holes in all of New England. Ranked as one of the top 100 public golf courses in America by Golf Digest, the Belgrade Lakes Golf Course is an unforgettable golfing experience for all abilities. Designed by architect Clive Clark, the Belgrade Lakes Golf Course uses its only landscape of rolling hills and rustic woodlands to make this one of the country’s best golf courses. Designed by Robert Trent Jones, Jr., the Sunday River Golf Course offers spectacular mountain views overlooking the Sunday River Valley and Mahoosuc Range. This championship 18-hole course has been names to Golf Magazine’s list of “Top 100 Course You Can Play” and No. 1 golf course in Maine by Golfweek. It’s the perfect course to play in October when the leaves are changing. Voted as one of the “Best Courses You Can Play” last year by Golfweek, the Ledges Golf Course offers a memorable golf experience at an affordable price. The course is challenging with lots of water obstacles, but that’s half the fun. You’ll love this 18-hole course designed by Maine’s own, Brad Booth. Situated on 200 acres of rolling hills in Auburn, Fox Ridge Golf Course is an 18-hole championship course designed by C. Lennie Myshrall. 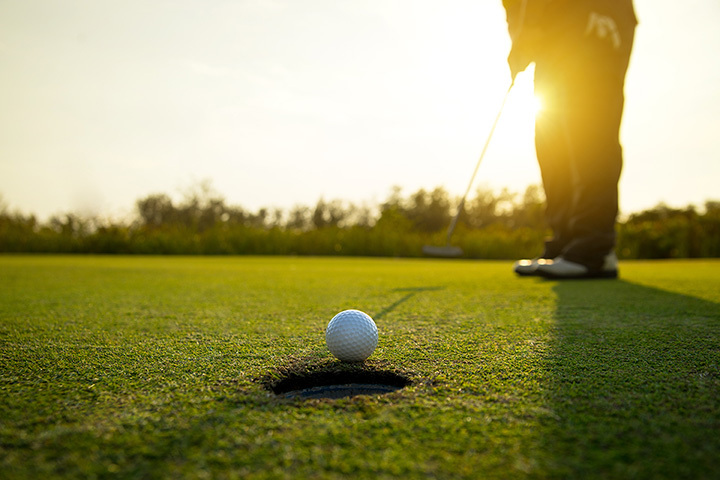 With plenty of natural hazards and lessons available, Fox Ridge Golf Course is the perfect place to practice your swing and technique. As one of Maine’s premier golf destinations, the Sugarloaf Golf Course should be on every golfer’s bucket list. Designed by Robert Trent Jones, Jr., the course offers panoramic views of the mountain and woodlands. With dramatic elevation changes and natural hazards, this 18-hole course is certainly challenging. Located within a 30-minute drive from Portland, Spring Meadows in Gray is a premier 18-hole championship golf course with a versatile design perfect for all golf abilities. Spring Meadows is impeccably maintained and very affordable. Recognized as one of the best golf courses in Maine, Point Sebago’s 18-hole championship course is situated on 500 acres of white birch forest near Sebago Lake. The course is varied and uses its natural landscape to create a challenging course that all golfers will love. The golf school is top notch as well. Nestled on over 300 acres of wooded, back dunes near the Atlantic Ocean, the Dunegrass Golf Course is an 18-hole course with a par 72. Each hole has four sets of tees so the course is perfect for all levels of golfers. You’ll find plenty of natural features like hills, streams, and rock croppings on this idyllic course.